Thanks to Joey, the genius behind Thoughts and Afterthoughts, for tagging me for the Totally Should’ve Book Tag. I’m totally excited to give my thoughts on what should’ve gone down with some of my favorite or not so favorite books. This will probably be an unpopular opinion, but I would like a sequel to The Spectacular Now. The ending was totally frustrating and I would like to find out how life turned out for both Sutter and Aimee. Waiting on the Sidelines had a sequel (Going Long), but I would totally like to see a spin-off series about secondary characters Sean and Becky. I think it would be fun to watch their relationship unfold. Can we just turn back time and erase the last third of Daughter of Smoke & Bone so I can forget about Madrigal and enjoy Karou again? Maybe then I’d totally read the rest of the series. Hello, Kurt Sutter, I think you totally need to adapt Nine Minutes into a T.V. show. It would make your next Sons of Anarchy-ish show. And if you could also cast Charlie Hunnam as Grizz, I would be soooo happy with you. Pretty please? I think Mud Vein would be a totally killer movie. It’s would make a gritty thriller. I can already picture it all dark and disturbing. 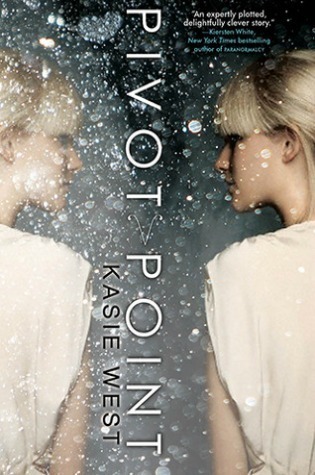 One point of view I totally loved in Pivot Point. The other I hated. I get why both were written but I wish it had only had the one. It would have been much more pleasant to read. I don’t know if you can tell by the small picture, but the cover model has this totally weird smile on his face. It’s kind of creepy, part smirk or something. The smile just didn’t fit Reckless Temptations for me. I totally should have stopped reading the beginning and just skipped to the end of Allegiant because the first two-thirds of it was so boring and drawn out. I’ve seen a couple of other covers for Will Grayson, Will Grayson and none of them are as good as this one. They totally shouldn’t have changed it. And I’m back to Nine Minutes again! Look at this cover. It’s not the most eye catching. The description also didn’t necessarily make me want to read this book. I only did it because I was heavily encouraged to do so. Now, it’s totally my favorite psychological thriller series out there. I don’t know why I felt to include totally in every answers. So silly. and anyone else who would really, really wants to do this tag! Thank you for tagging me! You’re welcome! It was a lot of fun! Aww that’s such a shame you didn’t like the Madrigal twist- I personally loved it, but to each their own. Yes I should’ve skipped to the end of Allegiant too- or just not bothered reading it altogether! Great post! Thanks so much for the tag! I know a lot of people will disagree with the Madrigal thing, but I can’t help it. 😉 You’re welcome! I can’t wait to read your answers. Pingback: BOOK TAG: Totally Should’ve… Book Tag – What's She Reading?